The most important thing is to get your soil in good condition before planting anything. Removing perennial weeds and incorporating plenty of organic matter or compost is hard work but it will be so beneficial. Look after your soil too: don't tread on it if it's too wet, as it compacts the soil and damages the soil's structure. If you're growing vegetables for the first time, plan a plot rotation even for a small area. If you live in an exposed place your plot will need some shelter against driving wind and rain. Windbreaks in the form of a hedge, fence or a wall will provide shelter to your plot to a distance five times their height. Hedges take time to grow and get established but they do provide excellent shelter as the wind filters through the gaps in the branches. To begin with, try growing seed in modules rather than sowing straight into the ground, as this gives you more control over quantities and also the chance to keep ahead of weeds and pests. The seedlings can then be transplanted into final positions and spacings once the weather is favourable. Don't be tempted to transplant seedlings too early, particularly if you have wet soil. 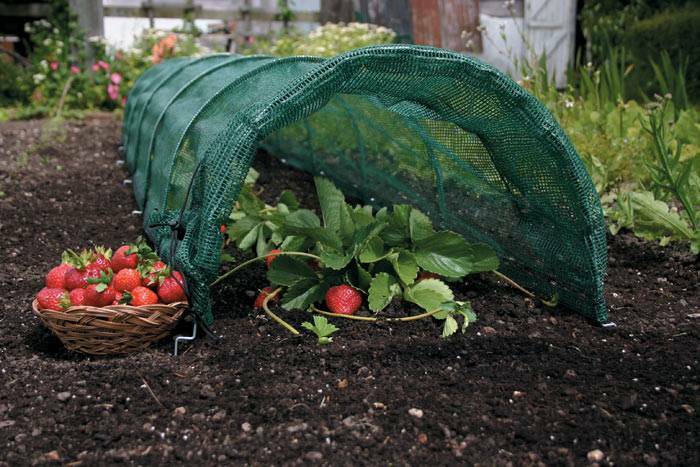 For a wide range of netting and protection tunnels ideal for protecting plants in open ground see the Netting & Protection category.